One of Samsung's newest mid-range smartphones, the Galaxy J7 Pro, can now be bought in the US. While it's not officially sold by Samsung, the J7 Pro (model number J730G) can be purchased via Amazon from a third-party seller. This seems to be a version of the phone that's made for Latin America, so it' s fully compatible with GSM/LTE carriers like AT&T and T-Mobile, but, unfortunately, it does not come with US warranty. 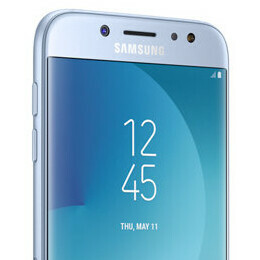 Essentially, the Galaxy J7 Pro is the same device that Samsung is selling in Europe under the name of Galaxy J7 (2017). This means it's different and better than AT&T's Galaxy J7 (2017) and the J7 that Samsung will officially offer starting this week - both these models share most of their specs with the old Galaxy J7 (2016). These names are a bit confusing, we know, but it's not our fault. It's Samsung's. The Samsung Galaxy J7 Pro is made out of metal, runs Android 7 Nougat out of the box, and is powered by an octa-core Exynos 7870 processor. The handset further features a 5.5-inch AMOLED display with 1080 x 1920 pixels, fingerprint scanner, 3 GB of RAM, 16 GB of expandable storage space, and a 3600 mAh battery. Moreover, there are two 13 MP cameras on board (front and rear), both with LED flashes. You can get the Galaxy J7 Pro via Amazon for $319.99, in multiple color variants: blue, black, gold, and pink. We'd say that $320 is a bit too much to pay for a mid-range handset that doesn't come with US warranty, especially since some comparable unlocked smartphones (including the Motorola G5 Plus or Nokia 6) are officially available stateside for less. Of course, if you really, really like the Galaxy J7 Pro, you should just go ahead and buy it - you can find it at the source link below. This is ate up. You shouldn't be able to sell an item that costs over 100$ in a country without a manufacturer warranty.